In a pathbreaking move the Ministry of Education in Finland has decided to merge three existing Universities under a common banner of The Innovation University that is now renamed as the Aalto University after the great Finnish architect and Furniture designer, Alvar Aaalto. The legislation and the system of funding the three Universities are being reworked and it is planned to launch the new University by August 2009. I met the Rector of the University of Art and Design Helsinki (TAIK) at the just concluded Helsinki Design Lab that brought together 80 design thinkers and professionals from around the world to explore the emerging boundaries of innovation in a very interesting workshop format. The initiatives are backed by both the Government of Finland as well as the local industry that has found it useful to support education and research since they have been looking for global leadership rather than just following the lead of other players in their field. Design is to play a central role and from being focused on Art and individual expression the move is to bring in collaborative creativity and innovation by locating the emphasis on the bringing together of design , technology and business within education at the University level. While there are many skeptics to this move it was perhaps the most open and transparent process possible with over 8000-contributions and arguments made on a year long exchange platform that offered access to all stakeholders along with a multi-stakeholder process of committees and task groups. The participants were drawn from all three Universities and included Administrators, Teachers and Students. I do think that we need to re-examine our University structure and objectives in the light of these experiments taking place in Finland and with NID being considered for a Deemed to be University status can we think forward and see how the technology and business areas can be brought to focus on innovation in the days ahead. We are all in our own mental jails till we get liberated by an imaginative thought that can change our belief. I came here to participate in the Helsinki Design Lab and found that the organisers were thinking far ahead with the Innovation University and new education paradigms. Image: Projects from Korjan Design Studio: Set up by Dinesh and Rashmi Korjan, who have been role models for many young product designers in India since they stayed focused on their core area of product design when everyone else did a bit of interiors and graphics when the going was tough in the early days of establishing the profession in India. A number of young designers are on the lookout for exciting and challenging work that is both cutting edge as well as adequately remunerative. Existing and established companies in the manufacturing and service sectors would usually make them work their way up the organization as this is seen as the most productive route for learning on the job for most professions. However, in design, the most value is added usually at the strategic level (see levels of design model, Ranjan 1998) while young recruits are kept at the bottom of the value chain – at the tactical level or even the elaborative level – in some back office operation which does not challenge their imagination and conceptual skill sets that they have developed as a part of their education and training exposures in school as well as outside. Several designers turn to entrepreneurial ventures that offer design services to a variety of businesses and industries and this has been a well tested path for a large number of young designers since the entry barriers in the profession are indeed quite low as far as capital and infrastructure investments are concerned. These young designers would no doubt have to acquire new skill sets in management and people skills to be able to succeed to scale from small beginnings to support a large team and this is something that they learn on the job as they go forward in setting up their ventures and making a go of the whole effort. A number of our designer graduates have indeed taken this route with a good deal of success. Both the Government as well as several leading national institutions of technology, management and design is now encouraging entrepreneurship and incubation of new initiatives in India. The IIT’s, IIM’s and NID have all set up incubators to encourage both students and faculty in realizing their innovative dreams through these nascent incubation initiatives. Besides the Government initiated schools of higher education in India several private sector schools and universities have their active incubation initiatives such as the one in Nirma Institute of Technology in Ahmedabad and the Welingkar Institute of Management in Mumbai and now at a new campus in Bangalore. 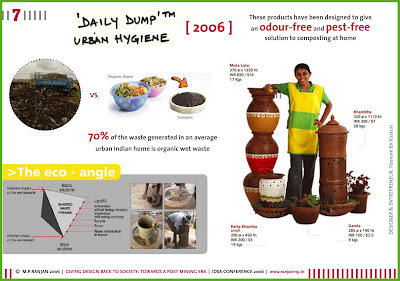 Image: Daily Dump: A new venture incubated at Srishti, Bangalore by Poonam Bir Kasturi and now it has grown to be a social design movement with clones in many parts of India and across the world. This particular model offers huge potential of using design to address pressing needs in the social space for quality products, services and attitude change that is critical if we are to offset the effects of global warming in the days ahead. Globalisation has brought other international formats of innovation and incubation support to Indian shores and many new finance and venture capital support systems have been created to encourage and support real passion and expertise particularly when the proof of concept is established by early stage prototypes or even market trials carried out by the designers and their colleagues in the case of new products and services offered by the incumbents own initiatives. This kind of build, operate and deliver model is fairly common in the software industry where small teams build exciting new products but vest part of their holding to the market or to a financier or venture capital support team after a period of development of the technical aspects of the product in order to rapidly scale up and compete with the existing players in the marketplace. Market launch and competition with existing large players is avoided in some cases and the field left to established players through a buy–in by the larger partner if the promoters are not able to scale the offering or able to garner the financial supports needed to make the shift. In some cases the company is brought to market through an Initial Public Offering (IPO) when the company is taken public and the promoters liquidate or reduce their holding at an appropriate value through a regulated process for such offerings. In India we have seen this kind of public issues based on product and service innovations in the areas of software, pharmaceuticals and in retail in recent years. Many of our design graduates who had established their own initiatives over the past ten years or more are finding new opportunities to bring in much needed capital to expand and scale up their business offering that has been proven in the market over time and by demonstration in the marketplace. This raises the big question of what is innovation and how can we unfold the value of the innovative process in the emerging era of the creative economy that is being discussed by many forward looking business thinkers. I had the opportunity to interact with the CNBC TV 18 team in analyzing several innovations that have emerged in the country through a broadcast programme called “Innovations at Work” that is anchored by Menaka Doshi and Cyrus and myself acted as expert guests on the panel. The CNBC TV18 team did all the background work on the seven selected innovations that are discussed in the programme while the expert guests brought their experience to bear on commenting on these from their own perspectives, mine from that of a design teacher at NID and Cyrus Driver spoke from the perspective of a venture capital expert with direct experience in building start-up companies. I have commented in an earlier post on the variety of businesses that had been started by NID graduates in the past and these I believe are the role models available today for young design students who are currently enrolled in our design schools across India. The facilities to spawn a vast network of such start-ups in India is still very limited but if we recognize the potential and provide the framework to nurture these initiatives as well as use the educational support networks and curriculum design that can enable such ventures we will be able to create the mind-sets that are required to make such ventures happen, and grow to become great value creators of our times. While most education programmes in design are aimed at creating employees for industry, I do believe there is scope for special institutions that can aim their programmes at seeding entrepreneurs across many areas of opportunity and such schools and programmes are the need of the day. I will explore the shape and contours of such a possibility in some future posts and such a format would need to be multi-disciplinary and bring together players and abilities that can enhance the process of incubation at the end of a period of nurture and capacity building. The KaosPilot in Scandinavia has shown that young individuals can be empowered and enabled to learn and build the necessary skills and confidence to set up new ventures in unconventional areas on business opportunity. If we were to explore the areas of need in India we can see enormous untapped possibilities in as many as 230 sectors of our economy for the use of design and design related services. Our design schools will need to strengthen their business process skills if the young designers are to be empowered to take on these real opportunities as well as be able to participate directly in such transformation processes at hand. Design schools also have the opportunity to attract a variety of skilled professionals into their fold so that domain expertise can be honed with a layer of design thinking and action skills that would be at the heart of any new enterprise building experiment. Tonight I have just returned from the inaugural session of the Helsinki Design Lab 2008 at the Wanha Satma in Helsinki and here we witnessed the formation of a major new Innovation University, which will merge together three existing Universities of Art & Design, Management and Technology to form a powerful new entity that is looking far into the future. 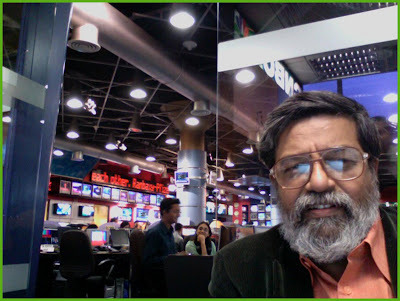 Image: Suresh Venkat, Satyashree Gandham, Charulata Menon and Prof M P Ranjan at the CNBC TV 18 studio in Mumbai after the shoot. and the guest experts are Prof. M P Ranjan, NID and Mr Cyrus Driver, CEO, Helix Investments which is a global venture capital fund looking at India. The programme has been announced yesterday on the channel immediately after the shoot was completed at their studio in Mumbai. The show will go on air on Wednesday, 25th June at 7:30 pm with a repeat on Saturday and Sunday at 6:30pm. The modules will then be aired each week over the next five weeks. More from Finland and I propose to visit UIAH after the SITRA event and meet friends in Helsinki. Image: Wall of tiles at the end of the Design Street at NID with a sampling of symbols and logos designed for various public and private Indian organizations. Visual Identity is the visible face of an organization and its services through which we recall and recognize the products and essence of the various offerings from a particular organization. This extends to both public service organizations such as the air, rail and road transport services as well as corporate organizations in manufacturing, finance and other services. At NID, the Communications Design faculty and students have been offering the services of designing such identities to corporate and government bodies almost from the very inception of the Institute and the setting up of its graphic design education programmes in the early 60’s. However very little is written about this work and therefore little is known about the contributions made by the NID designers to the Indian economy and its brand portfolio which most Indians are familiar with. The wall of tiles can be seen at the far end of the Design Street as a visitor passes through the NID building past the Fountain Plaza, the Gautam Gira Square and the Big Tree, all familiar landmarks to NID students and faculty. I do wish that some committed graphic design research is done to first document this legacy and then assess the worth of these contributions to the Indian people. The Communications Design activities have been at the centre of the NID education and professional offerings over the past 50 years and it is high time to look back at these offerings and explore the various dimensions and disciplines through which these have journeyed across the decades of sustained contribution. Over 800 public and private sector identities have been designed by the NID community and numerous other areas of design exploration include advertising, social communication, film making, animation, text book designing, typography, photography and illustration, to name only a few of the areas that form the body of communication design work from the Institute. If I step back in time, the first programme in Graphic Design and the other Communication Design disciplines was offered at NID in 1963 when a number of fine and applied artists were inducted into the first programme at NID under the stewardship of Dashrat G. Patel, Design Director, Visual Communication and several international design teachers who came to NID as consultants in the discipline. In those days the dominant disciplines were Graphic Design, Typography, Photography, Exhibition, Illustration, Animation, Sound and Film Making. Many of these were offered as specializations to the joining students after a period of basic design education at NID. The first programme in Communication Design commenced in 1963 with the induction of eight post graduate students. 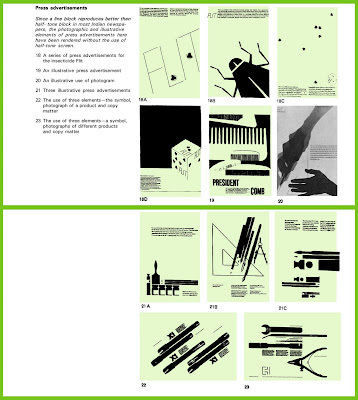 Image: Some garphic design assignments from the early sixties at NID. Image: The NID Main Gate and Prof M P Ranjan in his office at NID. The first programme for school leavers commenced in 1970 and the faculty here was drawn from the first three batches of Post Graduate students in Communications Design and Industrial Design, an all Indian faculty. Of the 24 students who joined the programme in the Foundation, 10 chose to join the Communications Design discipline. Eight students went to Industrial Design and six joined the Textile Design area. The Communications Design programme has grown from strength to strength over the years and some of the most respected design professionals in India in the fields of Graphics, Advertising, Animation, Film Making, Photography, Packaging, Branding, Social Communication, Book Design, and several other areas of specialization have come from these programmes at NID. While the numbers have always been rather small, I believe the impact has been quite significant and I am sure that time and the ongoing public reflections will show this to be so. I hope that the Golden Jubilee of the Eames Report will be an occasion to reflect on these contributions and to take stock of what has been done so far and to set the tone for the way forward. I also hope that some of these young designers will share their work in the days ahead in a substantial manner and from this we will be able to garner the shape of Indian communication design as a composite whole.